Select Export Options under the Export dropdown menu. In the Export Options dashboard, change the Citation Style to a style that has numeric citations and references. There are many! 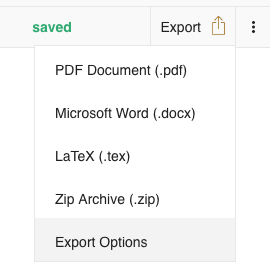 Some examples below indicate some options you have whether you are exporting your document to PDF or Word. Changing a style may also change ordering of references and their bibliographic style.